Even small amounts of light and noise can disturb sleep as you age. Many people can’t function very well unless they have got their full eight hours of sleep. Summer is great – but those bright summer mornings can really cause you to wake up earlier than you should. A beautiful sunrise can disturb your sleep quite badly if you do not have proper curtains in your bedroom window. Luckily there is quite an easy solution for this – blackout curtains. They help you block out 100% of daylight if you make sure that you have got wide enough curtains for your windows. 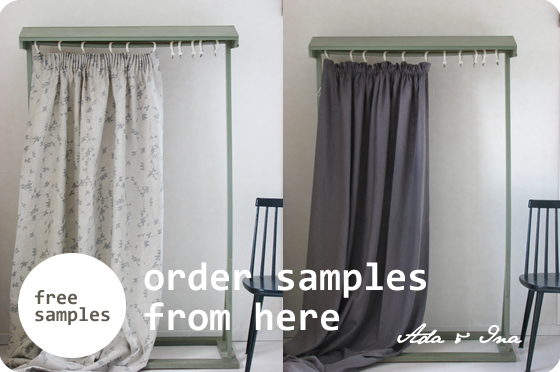 We make made to measure blackout curtains from all our linen and cotton curtain fabrics. You can even order your made to measure curtains with thermal and blackout lining – you will get extra insulation and block out all the light as well. Light and summer nights won’t disturb your sleep ever again if you have invested just a tiny bit more for blackout curtains. Made to measure blackout curtains are also the perfect solution for people who have to work night shifts and need to block out all the light in the bedroom in order to get proper sleep during the day. Ada&Ina Made to Measure Curtains are available with various linings but we recommend the blackout or blackout and thermal curtains especially for bedrooms. Blackout curtain lining which we use for our linen and cotton curtains is white and looks like ordinary cotton lining. Our blackout curtain lining material is good quality, feels nice and also dampens noise and helps to cut out unwanted sounds such as early morning traffic. All our made to measure roman blinds can be also ordered with blackout lining or with blackout and thermal lining. Your curtain fabric will look as stunning with blackout lining as it would look with ordinary cotton lining. It is definitely worth ordering made to measure blackout curtains for your bedroom if you would like to ensure a great night's sleep.